Despair no more, the lobster is here to help you! Nacho, Kurt and I started a new side project called Nuntius which lets you read notifications from your android phone directly on your beautiful GNOME desktop. 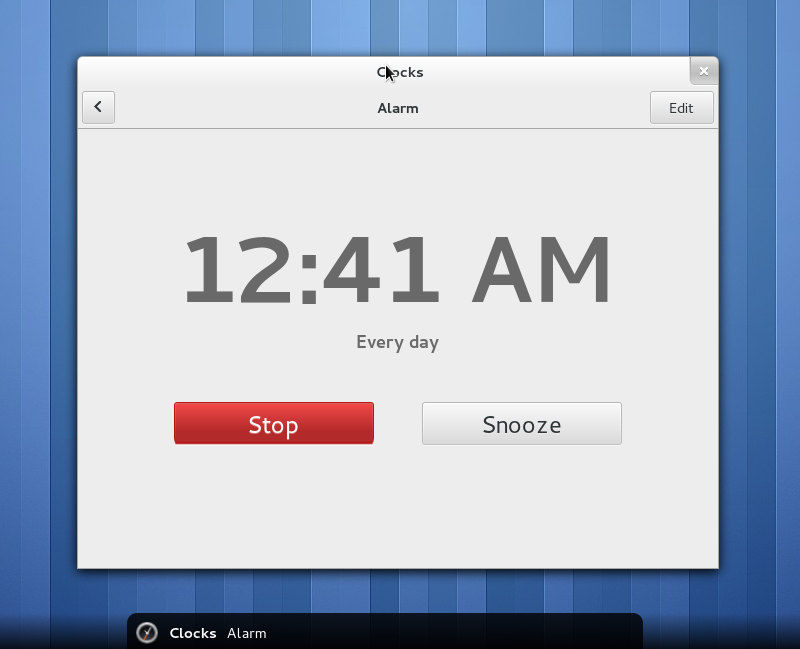 This is going to be even better with GNOME 3.16 and its redesigned notification system. Both the android application and the GNOME application are free software and are available on github, but the simplest way to try it is to install the android application from the Google Play Store, while the linux application is already available in Fedora and packaging for any other distribution is more than welcome. Nuntius uses bluetooth to communicate, this is not only a technological choice, but also a design one: notifications will be sent to the PC only when you are nearby and your messages stay local and private and will not be sent to “teh cloud”. In the best tradition of free software, this is a very early release with just the bare minimum functionality (for instance replying directly to a message from a GNOME notification is not implemented yet) and we welcome any feedback and help. As many other already expressed on planet GNOME, I find Philip‘s post pretty disconcerting, especially since he mentions some of the projects I work on and that over the last years have seen many successful and rewarding contributions from OPW interns and GSOC students. With that said, I think we should take the time consider how to make programs like OPW and GSOC even more successful and effective than what we have today. Here are a few ideas… I am not sure that all of them are good, as a matter of fact I can think of a few downsides to some of them, but I think they are at least worth discussing. Beside the changes in the main user interface, there are other small gems that may be not as shiny, but are very useful to regular gedit users. 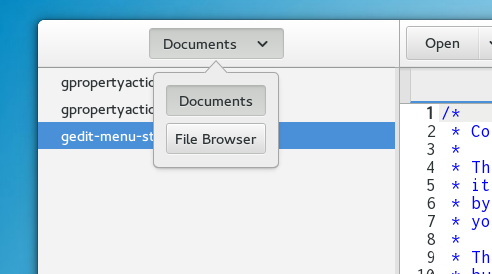 With the adoption the new user interface we changed the “new document” keyboard shortcut to the ubiquitous ctrl+T, and while at it we borrowed another neat trick from web browsers: with ctrl+shift+T you can now reopen the tabs you closed recently. Another small feature I find myself using more and more is the new keyboard shortcut to change the case of text: with ctrl+L you can change the selection to lower case and with shift+ctrl+L change it to uppercase. 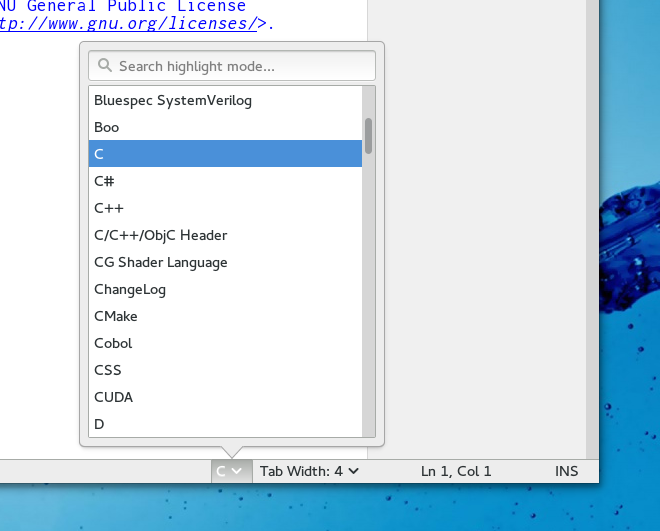 Ctrl+~ will toggle the case of the selected text. These actions are also available from the right click menu. gnome 3.8 is on track to be released on time as usual (the release candidate will be out later today): it’s a great incremental release with improvements all over the place, but I’ll let the release notes speak. For my own part, I put my fingers here and there either making patches or trying to help (annoy?) people doing the real hard work with reviews and suggestions. 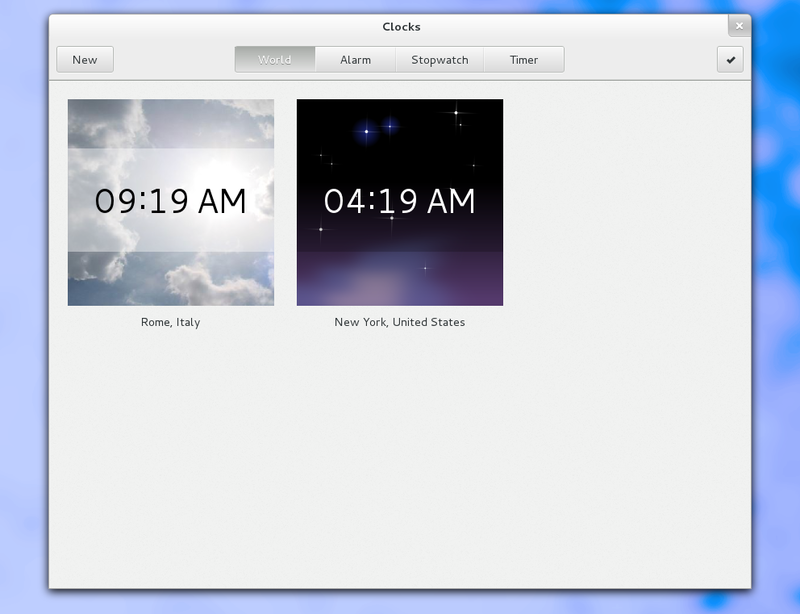 Clocks has matured from a prototype to a real app and in this cycle. 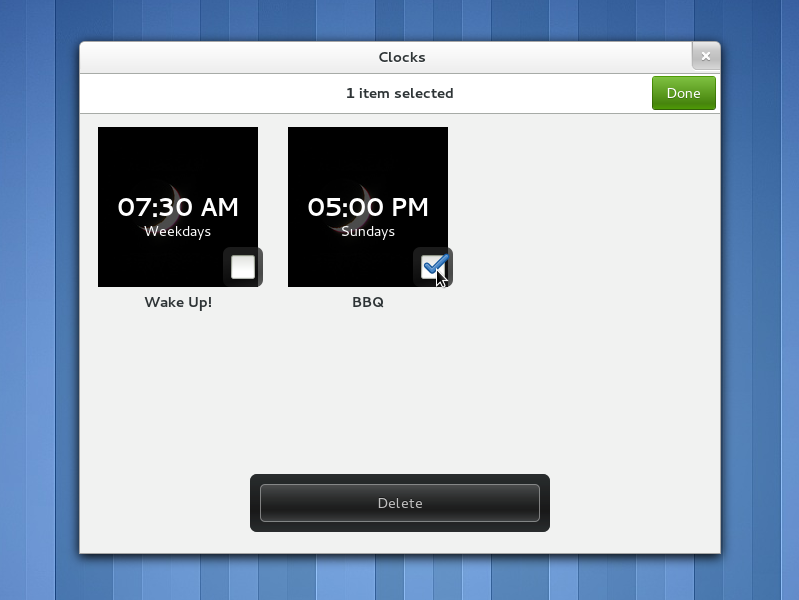 It turns out that while from the code point of view a clocks app is really a small application (some even think trivial and a waste of resources better spent improving other aspect of gnome) it is actually quite challanging to design and decide how all the small details should work, since the user expectations for such a familiar object are very high. 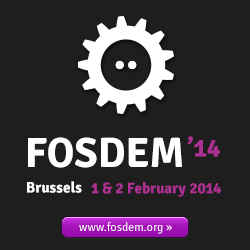 It has also been a good way to experiment with the new design patterns and the new widgets (like the ones in libgd). There are surely many things to improve in the next iteration, a particularly sore point that I am a bit ashamed to not have fixed yet it is the persistence of alarms when the app is not running (or even when the system is suspended), but today’s bug is tomorrows chance to get involved! The application went through a full rewrite to address many of the issues found in the first implementation. I opted for a rewrite in vala because it is probably the more mature technology if you want to write a GObject based app today and you are a bit sick of writing C boilerplate, but at the same time you need to pull some tricks to call some C code and libraries without proper introspection support. However I think the choice of the language is a secondary aspect of the rewrite compared to the use of some good practices I tried to adopt in the new code (use of many of the new prototype widgets in libgd, use of .ui files, use of GLib resources, use of GLib based library calls for everything, etc). Clocks is small enough I do not exclude to try a JS rewrite even if just as an exercise to see how the platform is maturing. In this regard I am really excited to see Giovanni’s work on defining a good platform for JS apps… I have some opinions in that regard (also due to the fact that I am back doing quite a bit of JS at work), but that’s probably best saved for another post. 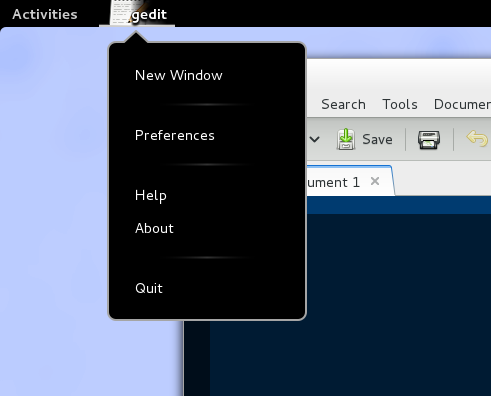 Gedit has been ported to GtkApplication: from the user point of view this mostly means that when run within gnome-shell you will see an appmenu (while you will get the usual menu when running on a WM that does not support that). 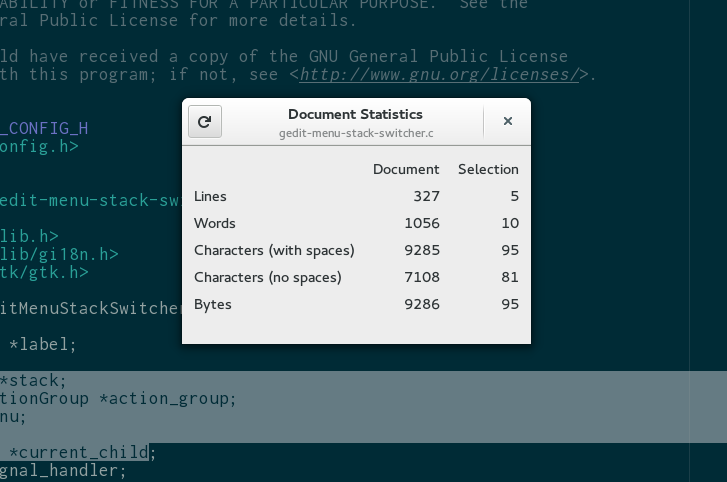 However under the hood this meant quite a lot of code to rework: gedit makes use of many exotic features of GtkApplication, like handling stdin (you have now to use cat file.txt | gedit – , note the dash at the end) and support for blocking the terminal in order to be able to use EDITOR=gedit for git commits etc). 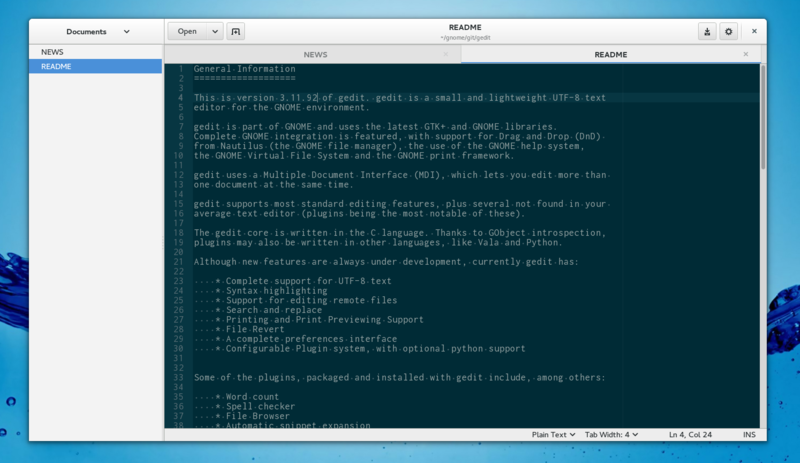 We also ported gedit plugin system to use Python 3, in compliance to a gnome wide goal. 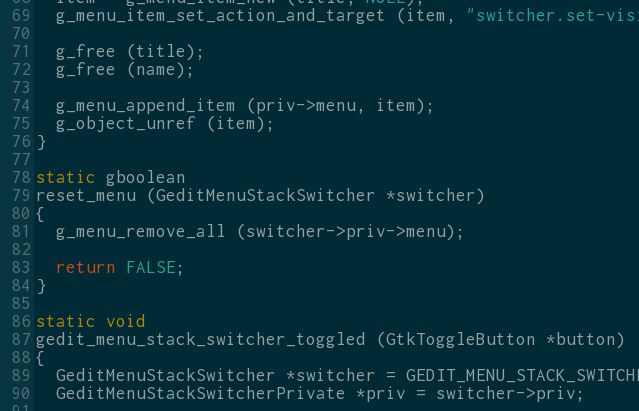 This has the unfortunate side effect of breaking third party plugins once again, but I think it is a step worth taking in the long term and the sooner the better: if you have to port your plugin you just need to specify “loader=python3” in the .plugin file and make sure the code is valid python 3, gedit’s API did not change. GtkSourceView has seen lots of work on the completion framework thanks to the Sebastien Wilmet, his blog has all the interesting details. Baobab saw a few of incremental improvements after the major rework of 3.6, including a classy animation from the summary to the results page thanks to the wonders of libgd. With regard to baobab, if you are looking for a challenging, but relatively small and fun project, it would be great to see someone step up and implement animated charts (Stefano had a prototype) and rework the treemap to use the squarified algorithm… It would probably make for a good GSOC project, though you would have to find a mentor since I do not think to have time to do that this year (unless a really strong and independent candidate shows up). Summer is almost over, or rather, my summer vacation is almost over. 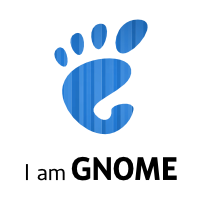 In the last weeks I have been actively working on GNOME like I hadn’t in a long time… Monday I will go back to work, but even if I will not have as much time, I will try to keep my level of involvement as high as possible. 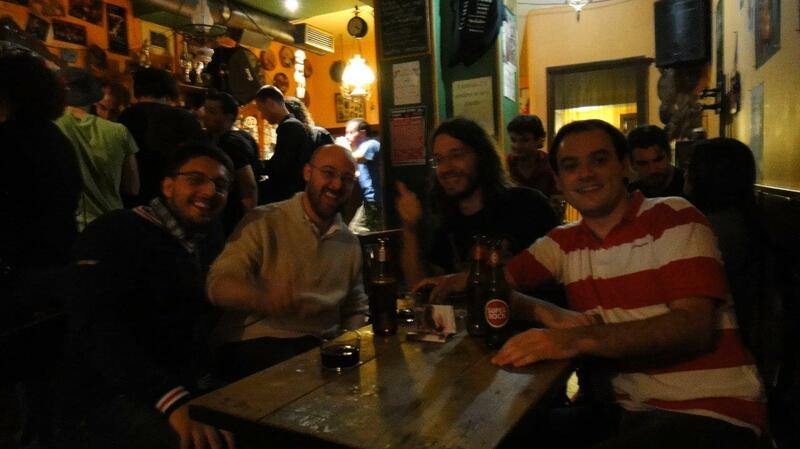 This renewed enthusiasm comes largely from one decision: attending GUADEC. I have been working on GNOME for more or less ten years now, but I attended GUADEC just once before (Stuttgart 2005) and I figured it was time to go again and see if a visit to the self-congratulating echo chamber could renew my interest and motivations… and guess what: it did! 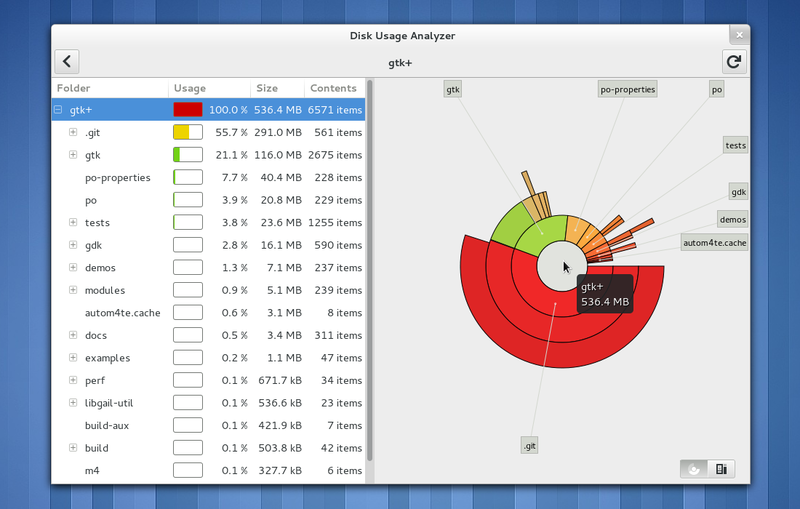 Between a talk and the other I also came to the realization that I needed to work on something fresh and fun, so while in A Coruna I finished the redesign and rewrite of Baobab, GNOME’s disk usage analyzer, that Ryan started last winter. I am really happy with the result both in terms of the new UI and in the underlying code, which is now written in vala, it is small and clean and makes use of many of the latest GNOME technologies. Developing small applications is so much fun and so rewarding that it is addictive, so after A Coruna (and after a couple of days getting sunburned enjoying nacho‘s hospitality in the south of Galicia) I decided to help getting gnome-clocks ready: this was even more fun because the work was shared with other current developers and designers, but also with some new contributors. 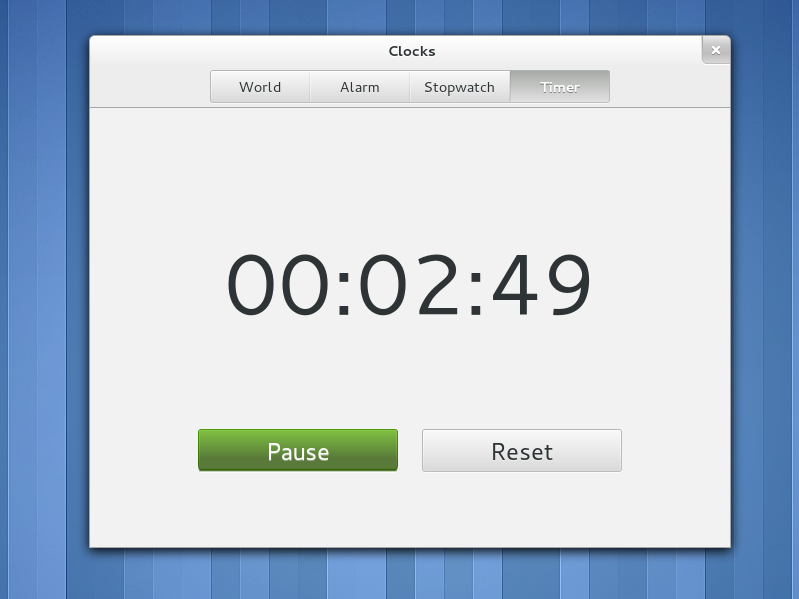 I just uploaded the first release of Clocks, in time for GNOME 3.5.91. While I was in flight over the Atlantic to come back to the old Europe, the awesome gnome release team finally put out GNOME 3. Not only that, www.gnome.org now sports a fresh new look, but most importantly some great new content. I am of the opinion that the primary measure of success of an open source project is its ability to attract and keep contributors and I think in this regard GNOME 3 is already a success. The changes in the UI – even the controversial ones – managed to revitalize a project that was slowly falling in a drowsy routine, refocusing efforts of long-standing contributors and attracting new forces. At the same time the great efforts spent cleaning up the programming platform provide a future-proof foundation which makes contributing easier and more fun. 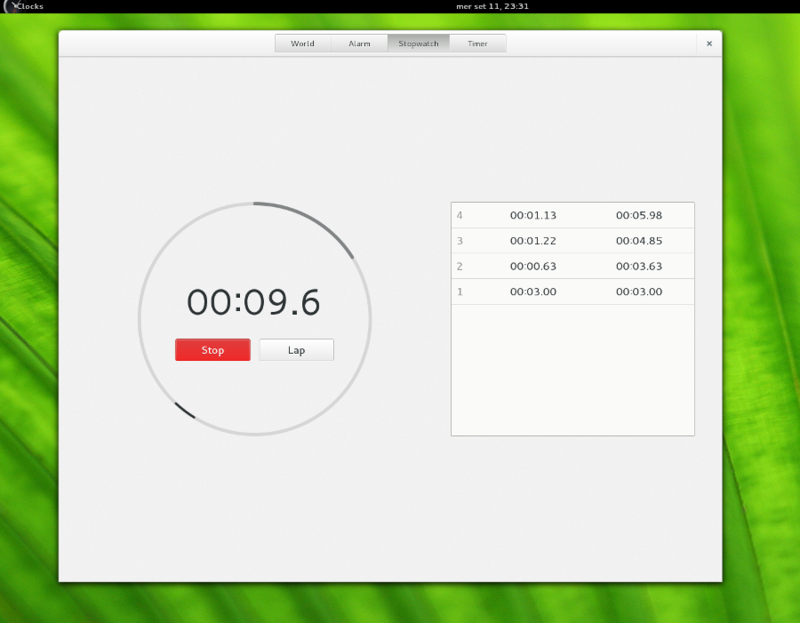 Time to make patches, GNOME 3.2 is right ’round the corner!